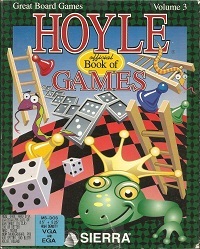 Hoyle Volume 3 is a compilation of six board games for young and old, to play by yourself against computer opponents or together with friends or family. Like Hoyle 1, this package offers gamers the chance to challenge many of Sierra's favorite characters, both good and evil and each with their own skill levels. - Checkers: Use a regular checker board and pieces or jumping frogs in a pond. - Dominoes: a two-player game with variable rules. - Snakes and Ladders: race to the top without sliding down the snakes, a game for young children. - Backgammon: for two players with variations and two boards to chose from. - Yacht: a dice game for up to four players. Can you throw five of the same dice or a Straight? Throw the best combinations and beat your opponents on points. - Pachisi: the classic board game for up to four players with options to play with dice or shells and two boards to chose from. Children especially will love this collection. It teaches the games with variations in animation, lively music and great sound effects. With Hoyle 3, designed by Bridget McKenna, Sierra changed its direction for the Hoyle series more towards young audiences while also building in the option for multiple people to play simultaneously - a move which was deemed necessary after sales of Hoyle Volume 2: Solitaire fell short of expectations. While designer of Hoyle 1 and 2, Warren Schwader, did not design this game, he was the lead programmer. Being released in the early days of VGA graphics, the game had separate releases for EGA and VGA graphics. Several of the games in Hoyle 3 were re-released in the Crazy Nick's Software Picks bundles: King Graham's Board Game Challenge contains Checkers and Backgammon and Parlor Games with Laura Bow contains Yacht and Dominoes. 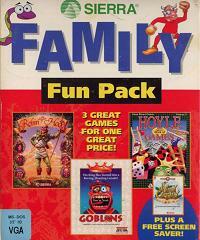 Hoyle 3 is also the oldest Hoyle game to be re-released on CD-ROM as a Sierra Originals title.